There are three schools of laundry: those who fold, those who don't, and those who hang nearly everything. Whatever school you choose (and you can change in mid-term with no penalties), you still need to know some simple steps on how to fold most types of clothes. Even if you are in the hanging school, this information will come in handy when packing a suitcase! The key to more painless folding is using a flat, non-back-breaking height surface. It can be a clean kitchen or laundry room counter or a kitchen table if you like to sit and fold. Even the bed is a nice flat surface. By using a flat surface you'll get cleaner, sharper folds and have a space to stack clothes so they won't fall over. As with any other task, folding clothes is a lot less scary if you aren't facing a mountain each time. If you don't have time to handle all of the freshly dried clothes at once, hang or fold the ones that will be worn on the outside like shirts, trousers, dresses, or skirts. If you don't have time to fold or hang, lay these pieces out flat on a counter or bed. Leave the undies and socks for later. Taking care of freshly dried clothes promptly saves you time in the long run because you reduce ironing needs and avoid rewashing just to remove wrinkles. If you forget a load in the dryer, wet a clean hand or dish towel and place it in the dryer drum with the wrinkled load. Set the dryer to medium heat and run for about 15 minutes. Remove the clothes immediately and fold. For linens, fold pillowcases right away so they are not wrinkled. If the sheets wrinkle, they are easier to smooth out while you make the bed. Most towels and washcloths don't wrinkle and can wait. 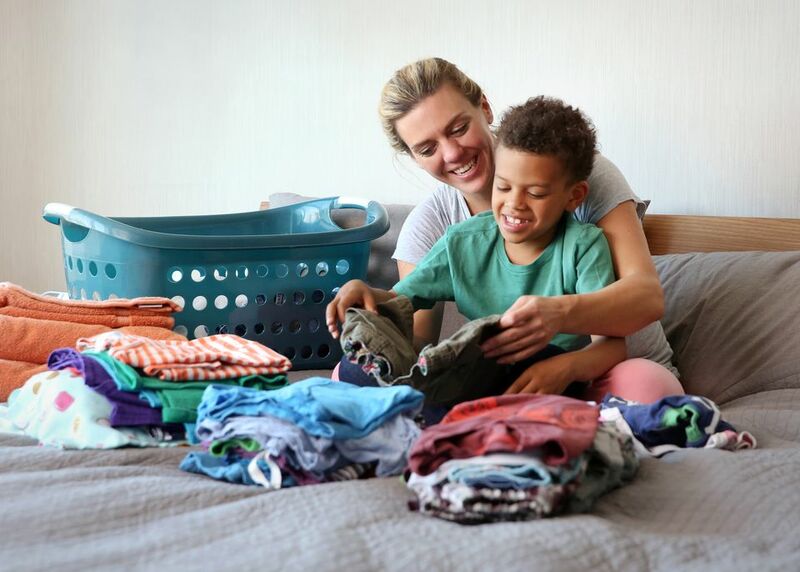 Laundry folding time is perfect for interacting with young children. They want to do what you're doing and this is safe and easy. Use the time to teach colors and shapes, and talk! Close all zippers and buttons. Hold pants vertically by the waist. Grab the front of the waist (near the zipper or top button) and pinch together the first two inches of the waistband on either side. Flatten the pants so that the crease falls on the front vertical fold and the inside and outside seams line up at the cuff. Starting at the cuff or bottom of the leg, fold the legs in half or thirds depending on how you plan to store the pants. Close all zippers and buttons. Hold the pants vertically by the waist. Fold along the center seams of the pants' body, bringing the legs together with the pockets on the outside. Close all buttons, snaps or zipper. Flatten the freshly dried or ironed shirt neatly on your folding surface with the front of the shirt facing down. Using the edge of the collar as a guide, fold one sleeve and about a third of the shirt toward the back of the shirt. Lay the sleeve flat so it lies vertically along the side of the shirt. Repeat with the other sleeve and side of the shirt. Fold the body of the shirt up toward the collar-either in half or thirds. Flip the shirt so that the front faces up. Flatten and smooth the shirt on the folding surface with the front of the shirt facing down. Using the shoulder seam as a guide, fold one sleeve and about a third of the shirt toward the back of the shirt. Lay the sleeve flat so it lies vertically along the side of the shirt. Fold the body of the shirt up toward the neckline in half or thirds. Smooth flat on a folding surface and then fold the garment vertically in half or thirds. Fold once horizontally, halfway down the garment. Lay one sock out flat on the folding surface and top with matching sock. Fold in half and set aside. Rolling the tops of the socks over each other to hold them together is great for kids. However, it will also weaken the elastic at the tops of the socks. Lay towel flat on folding surface and fold into thirds lengthwise. Fold bath and hand towel in half, then in half again. Fold washcloths in half only once. If hanging towels from a towel bar, do not fold a second time. Just slip over a towel bar to hang neatly. With the fitted sheet inside out, place one hand in each of two adjacent corners. Bring your right hand to your left, and fold the corner on your right hand over the one in your left, so the corner on top is right side out. Next, reach down and pick up the corner that is adjacent to the one that was in your right hand (it will be hanging in front), and fold it over the other two corners; this third corner will be inside out. Bring the last corner up, and fold it over the others so it is right-side out. Lay the sheet on a flat surface with the curved edges toward the center of the fabric to form a square shape. Fold the two outer edges in, so all the elastic is hidden. Fold the strip of fabric into a rectangle. Continue folding until the rectangle is the size you want. Fold flat sheet to matching rectangular size.